If you are a regular reader of this blog you will have probably noticed that I don't do reviews. I don't do advertising, in fact, the giveaway last week is the first time I have taken advantage of a giveaway sponsor. This blog is not a commercial enterprise. My patterns are for sale, but that income is for designing the patterns, not for blogging. This is the way I like it. This blog is my connection to the world, not a job. I'm not well enough to make it a job. If I have things like advertisers I start to worry about a posting schedule and blog content and all of a sudden I have pressure that I don't need. However, I am going to make an exception today. I am going to take part in a blog tour. The blog tour is to promote a book about a subject that is dear to my heart - wool, and more specifically British wool. This is a first for me, and I didn't receive any payment in return for my review, though I did receive a copy of the book, and I hope it goes without saying that all opinions are my own and I did not agree to give a positive review before taking part. 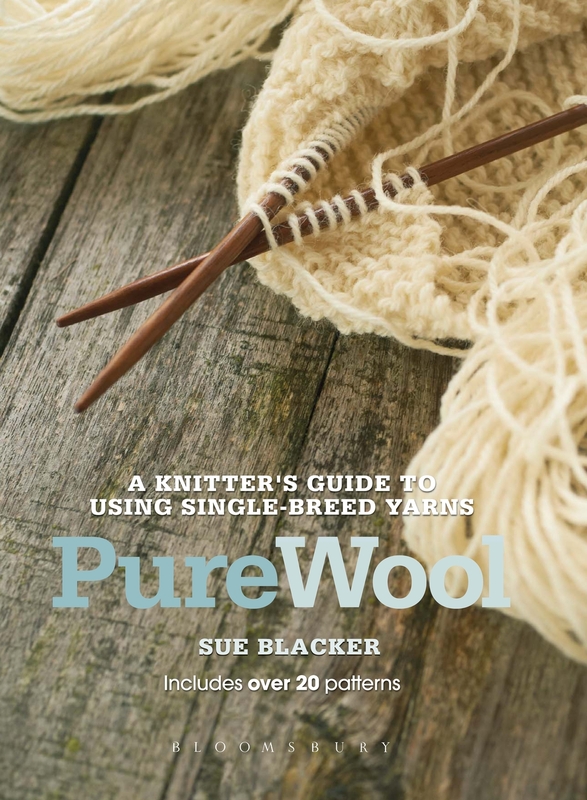 The author of this book is Sue Blacker who is a well known face on the British knitting scene. She runs and owns Blacker Yarns which concentrates on the sale of breed specific British yarns, which are produced in her specialist wool mill in Cornwall. She also spins the wool from other wool producers, who have small specialty flocks. Sue is also well known for her work on promoting British Wool. She has a vast range of knowledge about her passion and she has written this book about it called Pure Wool. As I received a physical copy of the book I can tell you that it is slightly wider, but shorter than an A4 sheet of paper and the cover has a flap at both the front and rear of the book. Jacket flaps are something I find really useful when reading or using a book, to mark my place. The text is in a nice clear font which makes it a pleasure to read rather an exercise in squinting. The cover and the pages are matte in finish, and the font is a soft grey colour, rather than black, creating a muted appearance to the book, without sacrificing clarity. As a "thing" this book is rather lovely. Now, onto the bit you are probably most interested in, the content. The book starts with a basic introduction to wool, discussing the process from shearing the sheep to the final plied yarn. This introduction also outlines the philosophy of Sue Blacker and her work. "It is obvious to me......that the arguments about and loveliness of natural wool should go hand-in-hand to sustain a future for both wool and sheep." There is also a section that details the terminology used throughout the book, that will probably prove to be very useful in future encounters with yarn of any type. After the introduction the book is divided into sections that relate to a specific breed of sheep and the fleece it produces. Each section is subdivided into a section regarding; fleece, the yarn it produces and one or two patterns that optimise the qualities of that specific breed's fibre. There are 17 breeds of sheep included in the book, some of which you will probably of heard of, such as the Blue-faced Leicester or Jacob, and others which are a little more obscure, such as the Manx Loaghtan and the Gotland. Each section gives a description of the heritage of the sheep breed and summarises lots of sources of further information on the breed. There is also a picture of the breed - and who doesn't like pictures of sheep? Then comes my favourite bit of this book, the Fleece Fact File page. This page has pictures of the raw fleece, scoured fleece and carded fleece. It also has images of different weights of spun yarn and an image of a knitted sample of the yarn, produced from this fleece. The Fleece Fact File page also gives a summary of qualities of the fleece, such as crimp, colours, and handle. It is these two parts of each section, that give all the information about the breed and it's fleece, which make this book a coffee table book. You can dip in and out of each section looking at interesting pictures and gaining snippets of information about sheep breeds and their fleeces. These sections alone would create a lovely book to own. However, there is more to this book than pictures and facts, there are also patterns. Each pattern is designed with a specific breed's fleece in mind. They are created to utilise the qualities that are evident in each fleece, as well as to produce an attractive and useful end product. The patterns range in complexity from a cafetiere and egg cosy, to stranded colourwork in a waistcoat and intricate cabling in a sweater. 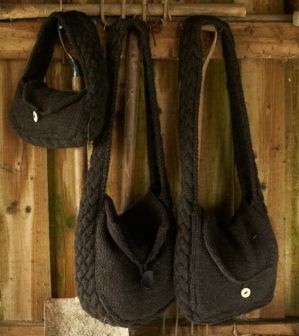 Wavy Cable Jumper by Amanda Jones that uses Pure Cotswold wool, and, as most of you know, I love a good bag, the Hebridean Handbag by Sue Blacker that uses Hebridean wool. The patterns are clearly written and have nice snippets of information about the designer and those who knitted the samples used in the book. I like to know about the designers of the patterns I knit and it is also a nice touch that acknowledges the sample knitters who are an incredibly important part of the process of the publication of patterns. Without good samples, no one would want to knit something, no matter how good they are told the design is. After the main sections of the book are detailed tables summarising all the information about the fleece and yarn qualities and suggestions for yarn replacements for the patterns in the book. It also has a section on dying the yarns. Overall, this book is full of useful and interesting information, alongside a wide range of patterns suitable for most abilities of knitter, that they can refer to time after time. It really is a lovely publication that I'm glad to have on my shelf of craft books. You can purchase the book directly from Blacker Yarns for £12+£3 P+P in the UK or on Amazon or through the publishers Bloomsbury Books or Stackpole Books for $19.99 in the US. 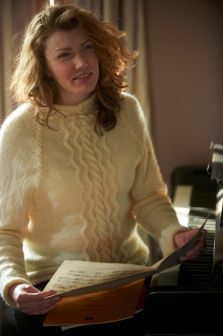 The next blog on the tour, is Shannon Okey's Knitgrrl. Go and read what she thinks tomorrow. NOTE: All photographs were provided by Bloomsbury Books on my request for the purposes of this post, and are copyrighted.